We gathered at Richard and Lynne’s lovely old corn mill on a glorious Summer day for a meeting held mostly in the garden. Whilst not a huge meeting (we were competing not only with the fine weather but also with the England vs Sweden match) it was certainly enthusiastically attended. We were delighted to have Yvonne Northcott with us, who has recently been in poor health, along with David of course and Yvonne’s charming carer Edivani. The model tour began with Martin Arnold who brought along his rendition of the ‘Living Locomotive’ which is model number 81 designed by Andreas Konkoly. Martin has previously shown other Konkoly models and they are always interesting. Andreas Konkoly (1918 – 2003) was a Hungarian whose models always strike me as a blend of engineering and art. The Living Locomotive is such an example and was typically well presented by Martin, making us all smile. 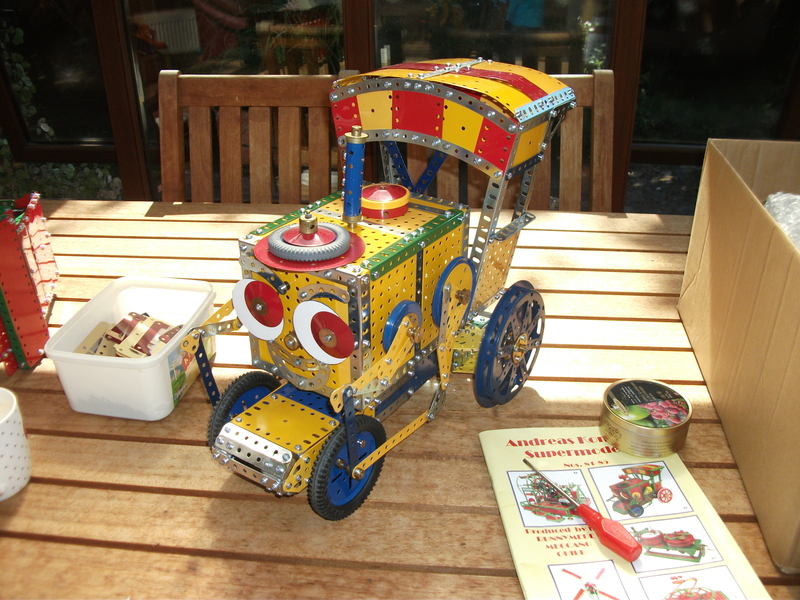 The complete set of Konkoly designs is available from the Runneymede Meccano Guild. Mark Bridle is in the early stages of constructing a P&H hybrid diesel/electric shovel in his usual medium red & green parts. Of particular interest at this early stage was a roller bearing, sold as a component for a ‘Lazy Susan’ revolving table. This compact bearing mated quite readily to Meccano and provided a very smooth and strong unit, negating the need for a separate hook roller. OK, it’s not Meccano but having been bought online at just over £6 it is a very affordable and useful way to incorporate a strong roller bearing into a small space. We look forward to seeing this model develop. Next was Pete Evans whose first item was a Meccano vertical steam engine (c.1929) which he picked up at a bargain price at the recent Skegness Meccano exhibition. This is a non-runner with several pieces missing. The chances are slim with such a rarity but if anybody has any parts for one of these engines then please speak to Pete. Also on show was a factory display model of a mechanical excavator, powered by the original mains motor and running very smoothly. 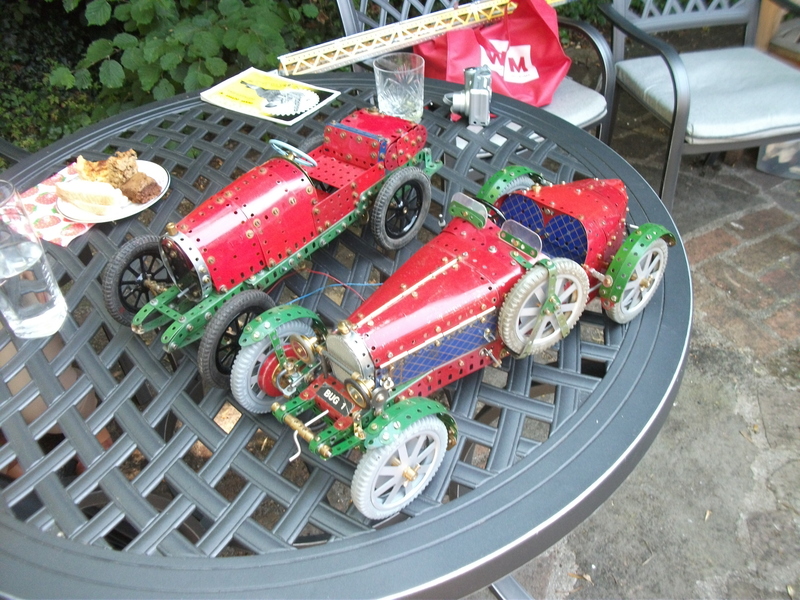 Pete also showed a Bugatti Type B car with wheels by Richard Smith and another Skegness purchase in the shape of a nickel-plated 2X set made for the American Meccano market and in a nicely restored box. David Northcott showed a lovely Type 13 Brescia Bugatti from the early 1920’s. This was an early design by Etore Bugatti, which with its 16 valve cylinder head was a successful racing car in its day. David’s scale model has a working drive train and captures the original very nicely indeed. Neil Bedford showed two very different army vehicles, firstly a large ‘Gama-Goat’ which was a US Army amphibious carrier with two articulated sections, 6-wheel drive and 4 wheel steering. The model includes a number of details including an animated crew of three Meccano figures dressed in army uniforms. Neil also showed a simple half-track constructed using parts from the rare ‘Mechanised Army’ set which was produced for two years only, from 1939 to 1941, just before the Meccano factory at Binns Road was turned over to munitions work. Sam Medworth is building a tower crane and brought along the triangular-section jib. This has been very neatly modelled in Yellow/Blue/Zinc parts and makes effective use of braced girders. This model is being based on a model plan by Philip Webb and one very interesting feature of Sam’s build are the long girders which Sam has restored using a clever electrolytic process (which I am sure he would happily share with anybody interested). ‘Some years ago’ Alan Perry passed his driving test in a blue Austin K2 lorry owned by his family and he is now lovingly recreating this same vehicle in Meccano form. The model is taking shape nicely with a detailed chassis and compact differential, as well as the main parts of the rear bodywork. Alan anticipates plenty more challenges though, before we can all enjoy sight of the finished model. At the recent Skegness Meccano Exhibition, our own Chris Bates won a well-deserved 5th place for his diorama model based around Bristol docks. Whilst the main feature is a large dockside crane, the diorama also includes a barge and a small locomotive with wagons and it was this latter item which we saw today. Whilst built as part of a diorama, the 0-6-0 steam locomotive ‘Henbury’ is a cracking little model in its own right. Chris has worked from original drawings to get the scale just right and finished the model in a very attractive matt green. 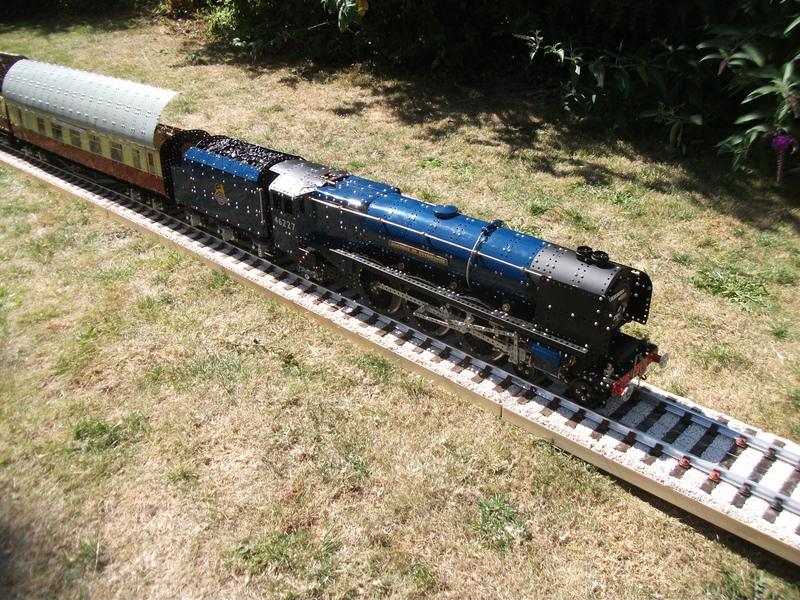 Moving from a beautiful small locomotive to a beautiful large locomotive, this report ends with Richard Smith’s fantastic display of model railway engineering. This display won second place at the Skegness exhibition but should really have come first (the voting at Skegness being a somewhat mysterious process!). First off was a 35ft length of very realistic track, stretching across the lawn. Parked at one end was the ‘Duchess of Hamilton’ resplendent in its Crimson Lake and Gold livery, today sporting its streamlined body and complete with tender. Running up and down the remainder of the track was a second large locomotive and tender, the ‘Duchess of Devonshire’ in British Railways blue and pulling two full-sized coaches. Each coach has full interior details, fabric covered seats, glazed windows, sliding compartment doors, even WC’s. Richard has cleverly painted one side of each carriage in the very pretty ‘Blood and Custard’ scheme, so that they can be pulled in one direction by the Duchess of Devonshire but has painted the other side in Crimson Lake and gold, so that they can be pulled in the opposite direction by the Duchess of Hamilton. 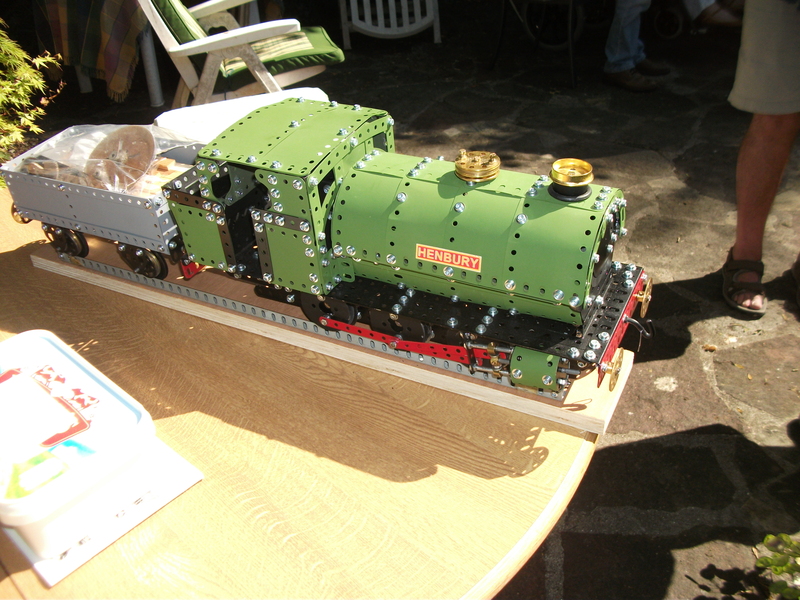 I think it is fair to say that we were all somewhat awestruck - this really is just about as good as it gets for Meccano trains and was a great demonstration of what can be achieved with our favourite constructional system.